One of the stars of A&E’s Storage Wars, a reality show about storage locker auctions, just landed an incredible deal on a locker stuffed full to bursting with vintage video game hardware and cartridges. It’s a small fortune in games, over $50,000 worth, enough for the buyer to call it one of his “best ever” buys. The big find was featured on the first episode of the show’s 10th season, which premiered on April 12 and was shot in the city of Orange in southern California. On the show, as in most auctions of abandoned storage units, the door to the unit is opened for inspection, but the buyers cannot go inside or touch anything. They’ve got to make an educated decision based on the limited amount of information available. In the show’s second half, we find out what they got. 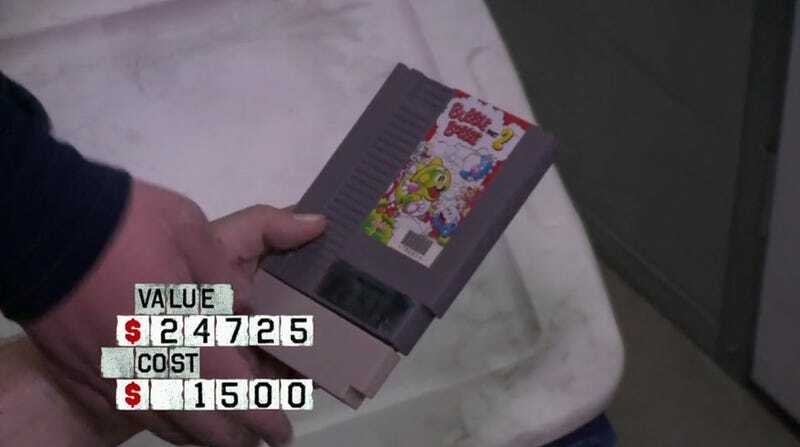 If you’ve ever heard of video games being featured on Storage Wars in the past, it may have been the infamous “NES-001" debacle, in which a buyer pulled a dusty, incomplete Nintendo Entertainment System out of a unit and declared that it was worth $10,000, only to find out that it was barely worth $10. The video game treasure trove is the day’s final unit. The two previous units were attractive, from the outside—they were clean, orderly, and full of plastic Rubbermaid tubs, generally an indication that they are full of quality items, not trash. Buyers Ivy Calvin and Darrell Sheets each pick up a unit, paying modest amounts of money. Then the door rolls up on the final unit of the day. “I really want this locker,” says buyer Rene Nezhoda. “It’s a good room, it’s full of vintage stuff,” Sheets notes. Many video games are immediately visible in the front of the locker. They’re all covered in a layer of dirt, the boxes are crumbling and breaking, but we can immediately see a Super NES Game Genie code book, a Coleco Pong-style dedicated machine, a Sega Master System game and a Sega Saturn disc. And a rare “dogbone”-style NES controller, the one that shipped with the later model of the 8-bit system. And a freaking Vectrex, a game system with a built-in vector graphics monitor. If that works, it’s $200-250 on its own. That’s just what we, the viewers, are shown, and the auctioneer makes a point to note that this is a big locker, the dimensions of which stretch far past the door. You can barely see the back wall for the giant pile of dusty gold. All four bidders get in on the action. Padian says she wants to try to get it “cheap,” but doesn’t want to go too high. She pushes it up, but drops out at $1400. Nezhoda takes it for $1500, an absolute steal if the video games go all the way back. In the second half of the segment, we find out that there will be no NES-001 mistakes this time, as Nezhoda has brought an expert with him to empty the unit: The show ID’s him as “Fluffy,” and some quick extra research reveals him to be Phillip “Fluffy Gamer” Braden, a classic gaming YouTuber of some reknown. The first thing they pull out is a gigantic box of miscellaneous game cartridges containing Sega Genesis, Super NES, Nintendo 64, and NES games. “Fluffy” immediately proves his bona fides by pulling out S.C.A.T., an NES game by Natsume whose value he pegs at roughly $200. (It’s around $125-250 on eBay, but close enough for guesstimate work.) He then pulls out a cartridge-only copy of M.U.S.H.A., one of the rarest Sega Genesis games, which is another $200. I know what you’re thinking—will the next game’s title be a six-letter acronym? Certainly not all the cartridges are worth this much, but there are just so many of them that it quickly adds up even with conservative estimation. Nezhoda and “Fluffy” line up a row of boxes down the hallway of the storage facility and start opening them one-by-one, which the show cuts into a rapid-fire montage. More boxes of carts from everything you can imagine: Intellivision, Atari 5200, the Commodore VIC-20 computer, the Fairchild Channel F.
A box full of Nintendo’s handheld Game & Watch units. The scene closes on “Fluffy” really losing his mind over a copy of Bubble Bobble Part 2 for the NES. He says it’s worth $500, it’s really worth about $300-350, but again, who’s gonna quibble. (Me, I guess.) It’s attached to an adapter that lets you play NES games on a Famicom system, probably because the collector who owned these had an inexpensive early-2000's “Famiclone” unit to play them on. Looking at a pile of boxes still in the unit but needing to wrap up the segment, Nezhoda guesses it’s about $45,000 in total, which if anything seems conservative. From what I can see, the collector whose locker was (for whatever sad reason) auctioned off was picking up games on the cheap and building a personal library, probably in the late 1990s. In all of the footage, we don’t see any duplicate games, indicating that this person wasn’t hoarding overstock or anything like that—they were clearly going out and hunting down one copy of each game for early gaming platforms. Almost every game is a loose cartridge, which is also interesting, since even today it’s much more common to find TurboGrafx and Genesis games still inside their hard plastic cases, which the original buyer of the games generally kept even if they threw away NES cardboard boxes. This collector was probably actively getting rid of (by selling or giving away) any boxes and manuals they picked up, consciously saving money and/or space by building a loose-cartridge library. These games were probably worth very little money when the collector bought them, which also explains the uncleanliness of the storage. “Fluffy” has since posted a video to his channel in which he and Nezhoda discuss the aftermath of the day’s work. You’ll be happy to know that Nezhoda hooked “Fluffy” up with some bro prices and gave him M.U.S.H.A. for $120 as thanks for his help. And it seems like there may be some more secrets to this unit that weren’t mentioned on the show, as Nezhoda says that there were some “prototype games” in the find. If you want to follow along, Nezhoda is posting regular update videos about the find on his own YouTube channel, as he sorts through and prices the games. They’re apparently available for sale at Nezhoda’s store Bargain Hunters Thrift just north of San Diego.